The showdown between President Trump and the NFL over some players’ decision to kneel during the national anthem to protest racial injustice has raised all kinds of important issues. It’s also put the most popular major sports league in the United States in a difficult position. The NFL’s fan base is much more bipartisan than those of other major sports leagues, and it risks angering one side or the other if it mishandles the situation. Of course, not every person in a team’s market actually is a fan of football, and some teams have fan bases that extend well beyond their television market. To quantify the political affiliations of each team’s fan base, we commissioned a SurveyMonkey Audience poll of 2,290 American NFL fans in early September5 that asked them to list their three favorite teams, as well as the political party with which they identify. Sample sizes ranged from 526 respondents who put the Green Bay Packers in their top three to 41 for the Jacksonville Jaguars; the average margin of error6 was +/- 7 percentage points. Here’s the breakdown of each fan base by party affiliation, according to our poll. Keep in mind that more Americans self-identify as Democrats than Republicans. In our poll, the average team’s fan base is made up of 6 percentage points more Democrats than Republicans. The key is to look at how each team’s fan base compares to the average. 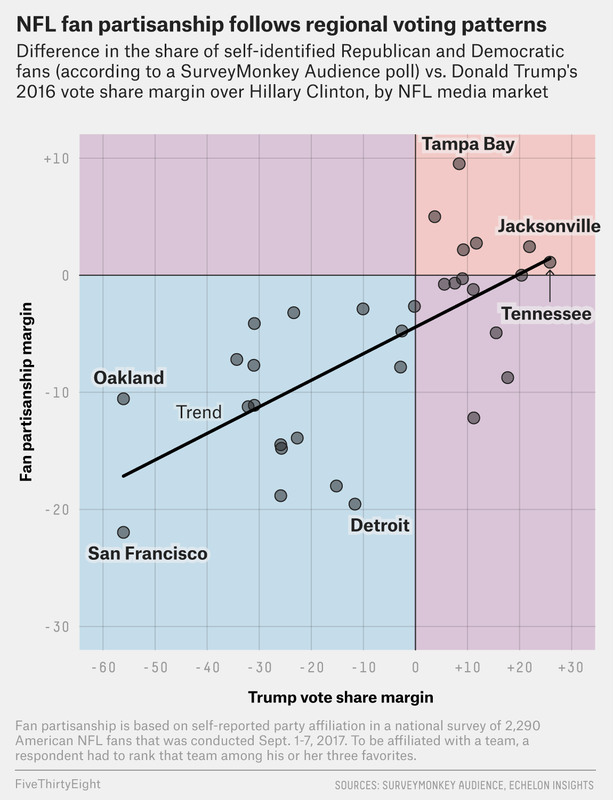 For example, teams based in the Republican-leaning areas of Jacksonville, Florida, and Nashville, Tennessee, have more Republican-leaning fan bases — in terms of the percentage of fans identifying as Republicans minus the percentage identifying as Democrats — than average. (This made the Tennessee players’ decision to not be on the field during last week’s playing of the national anthem especially interesting.) The same goes for the Buffalo Bills and Pittsburgh Steelers, each of whom saw internal friction over their response to Trump. 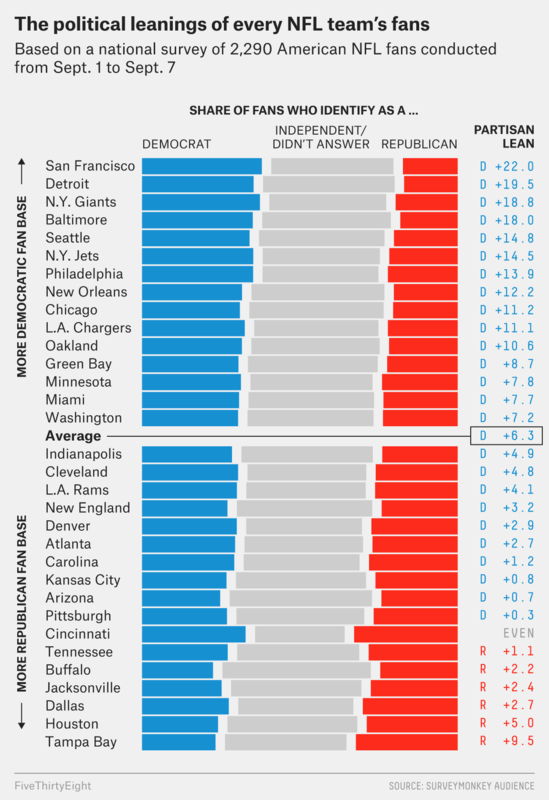 On the other end, Democrats tend to hold their biggest edge among teams based in major metropolitan areas where Clinton did best, like New York, Chicago and the Bay Area, where the Oakland Raiders have been especially active in kneeling during the anthem. There were a few surprises in the data. The New England Patriots, despite being based in the Democratic bastion of Massachusetts, have a fan base that is slightly more Republican than the average team. The reason is that even though New England fans who live in Massachusetts are overwhelmingly Democratic, the Patriots fans who live outside of Massachusetts (of whom there are many) are much more Republican than the average NFL fan. Likewise, much of the fan base for the recently relocated Los Angeles Rams is from outside California, which helps to explain why Ram fans are more Republican than you’d expect given that the team plays in the very anti-Trump Los Angeles market. There was also a major partisan split between the two most popular teams in our poll: the Dallas Cowboys and Green Bay Packers. 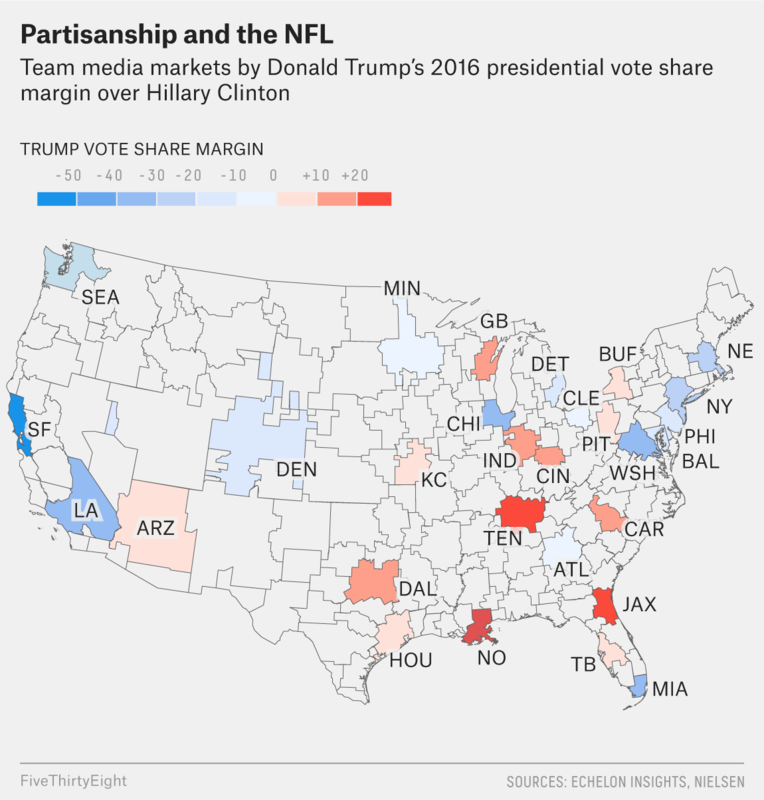 Unlike the Patriots, both the Cowboys and Packers are based in Trump-friendly areas. (Trump carried the Dallas media market by 12 percentage points; he carried the Green Bay media market by 18 points.) Yet, according to our poll, the Cowboy fan base is far more Republican than the Packer fan base. That may be why Cowboys owner Jerry Jones has tried to remain in Trump’s good graces. The Democratic lean of the Packer fan base may be tied to the fact that the Green Bay area has the smallest television market of any NFL franchise. This means that to become such a well-liked team, the Packers had to pick up a lot of fans outside of Green Bay (only 9 percent of Packer fans are based in Wisconsin). Therefore, it shouldn’t be surprising that the partisan breakdown of the overall Packer fan base is closer to the national average for NFL team fan bases. Arguably, though, the biggest takeaway from our poll is that every team in the NFL has both Democrats and Republicans in their fan base. No matter what teams choose to do during the anthem — they’re probably going to get in some trouble with some portion of their fan base. And as long as Trump keeps up his fight with the NFL, all eyes will continue to be on sidelines before each game. Excluding the Alaska markets of Anchorage, Fairbanks and Juneau, none of which had complete search-traffic data. President Trump specifically mentioned NASCAR in several tweets over the past week. Weighted by the total number of votes cast in the 2016 presidential election in each market area. The fact that baseball is more popular in Clinton-friendly areas is probably because it is most relatively popular in the Northeast, which Clinton won by a sizable margin last November. 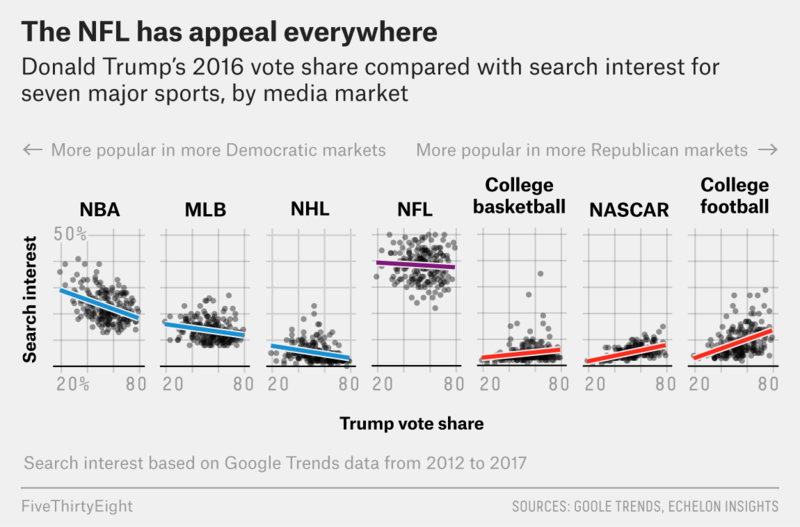 Polling does not indicate that baseball fans are overwhelmingly Democratic-leaning. Specifically, the poll was conducted among a national sample of adults ages 18 and older from Sept. 1 to Sept. 7. Only responses from self-described NFL fans (including those who labeled themselves “casual” fans) were included in the analysis. Computed according to the traditional formula, even though this poll technically uses non-probability sampling.